The comic series that almost happened, but didn't. 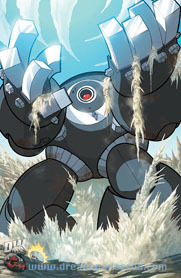 Dreamwave's comic is a big frustration for MM fans who both disliked it AND those who liked it. You see, for months it was touted a a monthly MM title and most eagerly anticipated it ........ however, by issue two the comic was slated for cancellation by the end of the first story arc. DW insiders reported a switch to X, however at the time of this writing it hasn't happened yet and this webmaster doubts it ever will. A DW insider said (on the forums) that the X comic was a possibility, but he hadn't heard anything definitive. Not a good sign. I suppose it was frustrating for most that after highly anticipating the series it let us down by not only leaving out the official characters, but also by ending after issue #2 (and after such a big buildup). Still, although they pushed the official characters out of the spotlight, this section is reserved for what's bound to be the most obscure characters in MM continuity! And also the changes they made to the staff we all know and love. Megaman - Everyone's favorite blue robot has been fighting robots going haywire for years in Mega City since everyone knows him! Rocky has the latest model of Dr. Light's Independent Decriminalization chip in his system and going to school (with the secret ID of "Rocky") is the best way for Dr. Light to test it. In addition to his game powers, Rocky gains new "Boot Boosters" which evidently give him short bursts of speed that enable him to jump high and dash. Rocky also changes into his Megaman gear via a watch. *mouse notes: Many are against the I.D. 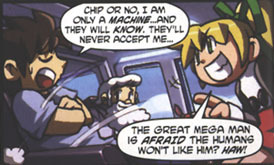 chip since X is supposed to be the first robot to think and feel in the games, however it's a fact that the official Megaman also thinks and feels. The difference between him and X has never been fully explained. 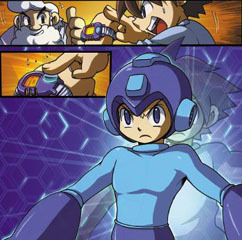 * Although people protest the watch idea, the games also show a flash of light when Rockman changes into his uniform similar to the Power Rangers, so it shouldn't be that frowned upon. 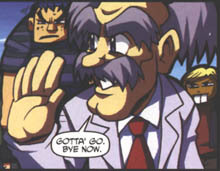 Auto - In the comics, Auto is akin to Dr. Light's butler and chauffeur. He does not seem to have much intelligence. His design is also slightly changed with the addition of a hand and no eyebrows. *mouse note: In the games, Auto is Dr. Light's lab assistant! Quite the change. 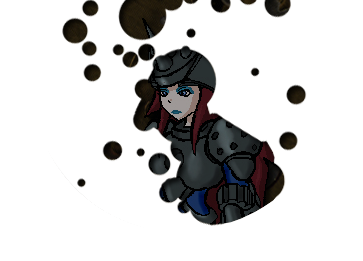 Roll - Roll's never been characterized well in the games, so it's difficult to judge whether she's changed any. Although she does tease Rocky and is noted for being "too independent already" for an I.D. chip. 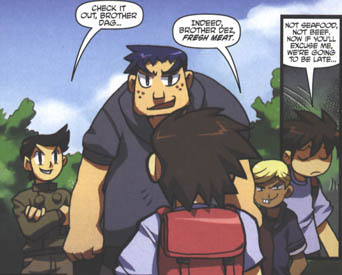 Other than the first issue and one panel in the last, Roll didn't have much of a ...... *ahem* role. Which is too bad, really. 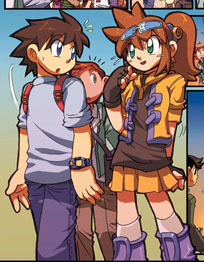 *mouse note: In a CD drama Rockman Kikki Ippatsu, Roll actually attends school in her own adventure! Too bad it was only a Wily trap. Rush - I only list Rush here to note that he doesn't talk and does fly as Rush Jet. *mouse note: Rush talks in the MM TV show, Captain N, One line of Rockman Manga, AND the Rockman OVAs. Rush was always meant to talk ........ much to everyone's dismay. Dr. Light - The creator of Megaman is as benevolent as ever. I can't say he's ever really been portrayed differently. Although here Light seems more concerned with the welfare of robots than other incarnations. It was pretty cool to see him blow up Wily's robots with a small remote he designed though. Light is still master of robotics. Protoman - Protoman wears a poncho for his initial appearance. 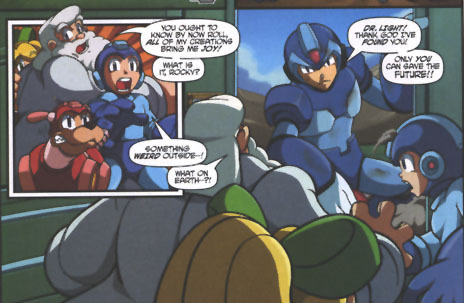 He's also fairly antisocial in this version, telling Megaman that he'd better not get used to working side by side. 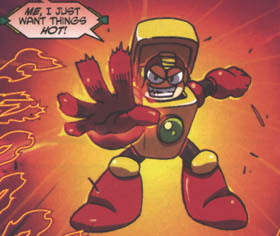 Heatman - Heatman is the only official robot master featured in the series. While issue 4 has many cameos of robot masters .... none of them played any role in the story. Heatman is a maniac who loves to cause destruction and can shoot fire from his fingertips. 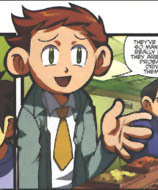 *mouse note: Heat's portrayed as a pyromaniac in Ariga's manga as well,although all the official info on Heat says he's actually pretty relaxed and lazy! Wily - Wily had little role in the series, which is really too bad. It's really hard to vary insane scientists, however this Wily is notable for leaving Light's Lab to set out on his own before Rocky was ever created. *mouse note: The most original version of Wily was Captain N's Wily. There he was less insane and more very sarcastic. Dez, Dix, and Dag (respectively) aka the Bolz Bros. The terrors of seventh grade in Mega City Junior High, these guys have flunked school for years. They just started picking on Rocky the day he entered school and have been fighting him more out of hurt pride more than anything. Of a more interesting note they are Wily's nephews. 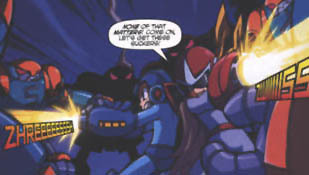 *mouse note: there's a sizable number that think the Boltz Bros. are robot masters in disguise because of their focus on Rocky and because in one (very cartoony) fight scene Dix ripped out a metal pipe and because in the games Wily has no nephews. I, however, think all that is baloney because Wily'd have to be clairvoyant to send his bots to school years before Rocky'd ever showed up! Alan - Rocky's best buddy until his glory fades away, Alan is the first friend Rocky makes at his new school. Chelsea - Rocky's love interest. She's supposed to be cute, tough and popular. She immediately made Rocky's mechanical heart pump faster. For reasons people can only guess the powers-that-be at DW decided against actually using established Robot Masters in their series! Instead we're treated to new robot masters which will undoubtedly be the most obscure robot masters to date in a few years from now. Since most of these guys have only brief appearances, I'll make up some info on them such as probable weapon obtained and serial number. WVN for "WaVe" as in Dreamwave (woulda preferred DWN, but that already stands for Doctor Wily Number). Also to note, there was a robotic DJ which MM fought ...... but his name didn't end in "man" so he's not a robot master. After all, if I had to consider HIM a robot master, I'd have to consider "Karate Bot" from the MM TV show a robot master too and that ain't happening! Weapon: Ion Blast - shoots an array of powerfully green-hued energy shots. (this weapon name is NOT made by me). Barrageman is a huge robot master whose head is as big as Megaman himself. However, Barrageman is no Einstein as he verbally says all of his thoughts and runs on a primitive AI. "Motor control minimal. Flight Orientation: Inverse. Assessment: Impossible without further data. Conclusion: Barrageman unit is under attack." Weapon: Solar Cannon - Fires fast shots of solar energy at a target. 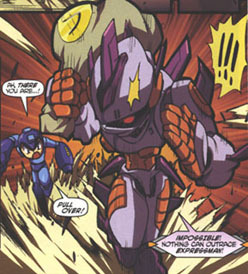 Expressman was made for speed, but can't outrun Megaman's Boot Boosters. 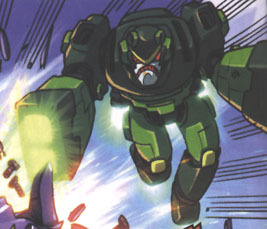 More intelligent than Barrageman, Expressman still is fairly weak in battle. "Impossible! Nothing can outrace Expressman!" Multiman's attack pattern is swam the enemy and overwhelm him with superior numbers. Possessing no offensive weapons, Multiman uses his great strength to defeat his adversaries. Multiman produces copies of himself with a miniature assembly line within his chest (which can also be used as a cage for prisoners). The new Multiman quickly increases in size and produces his own Multiman. Multiman can also fly, but never used this in battle. 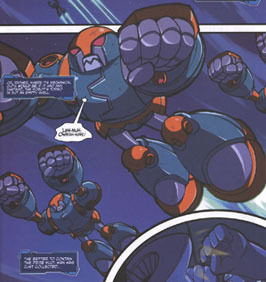 Multiman seems to be the most intelligent of the Dreamwave Comics Robots, using big words and all, but his fighting skills only know one tactic: overwhelm and destroy. "Robots have no friends, poser!" Never actually named in the comic. I'm sure any similarities with the Yellow Devil are solely due to Spaz's artistic interpretation. The Steel Devil is a giant mecha stored underneath Wily's current base. Being as big as it is, Rocky's Megabster had little effect, however the top is just glass so he was able to destroy it by breaking in and letting Protoman destroy the power supply. Megaman, the defender of Mega City USA now faces a new challenge: junior high! (Or, if yer Canadian, Elementary school!Oh those wacky culture changes). Meanwhile, robots are mysteriously going haywire all over the city. Who's causing this?? DOCTOR WILY!!! Big shocker. The art was great. The writing was good. As a story, it was pretty solid. I liked Light's characterization and the light hearted humor was a nice pace for the series. I read one review where the guy said it was "megaman flavored" more than having anything to do with Megaman himself ....... and I find myself agreeing. 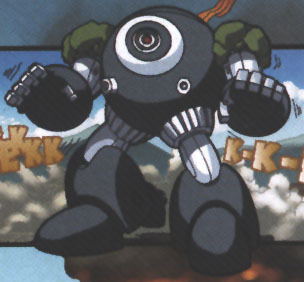 While Megaman fights Expressman, Barrageman, and a robotic D.J., the only true RM he's fought was Heatman. And while he did fight the "Steel Devil" and many RMs cameoed ......... that was in issue 4. After DW switched the artist. So, I feel those cameos and even the "Steel Devil" were more of Spaz's initiative than Augustyn's writing. And while not "bad", Augustyn didn't really show us what we bought the book to see: MM, his world, his friends and enemies. Instead we got whole NEW friends and enemies, which isn't bad necessarily, but becomes so because it pushed everything we really wanted to see off screen. And while Fong's artwork was great ....... Spaz's artwork greatly surpassed him. Fong had the cute side of MM down to a T, and while that worked fine for ME, it didn't sit right with some. Spaz drew MM allot like his official Capcom self, and to boot he added robot master in every place he could! Of course this was all in the last issue where it couldn't do one bit of good. 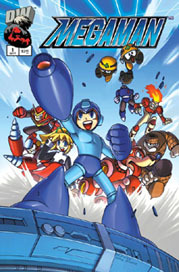 Megaman X - The final pages of the fourth issue of the "Mega Mini" was a plug for a new Megaman X story! It featured Vile and cameos from several Mavericks and Zero. In it, X travels to the past to enlist the aid of Doctor Light! Will this story see the light of day? Guess you'll have to write to Dreamwave to get them moving.